For some time, astrophysicists have argued over how many Dark Stars there might be in the galaxy, with varying opinions. 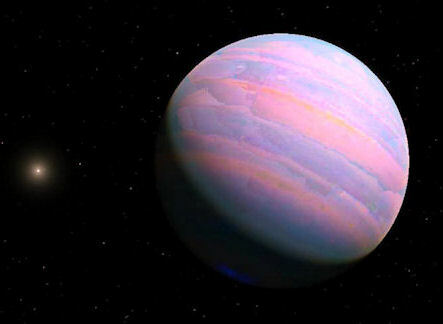 (Astronomers use several different names for these objects: sub-brown dwarfs, Y Dwarfs, 'planemos'). 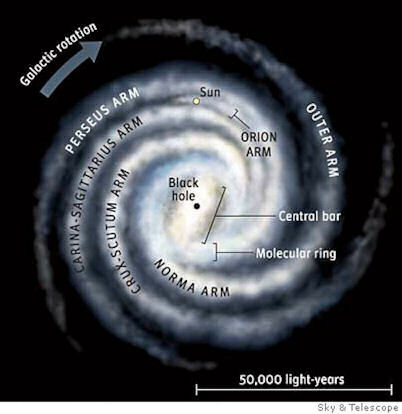 In this short article, I argue that new evidence presented about the stellar populations of open star clusters point towards there being more Dark Stars than stars in our galaxy. 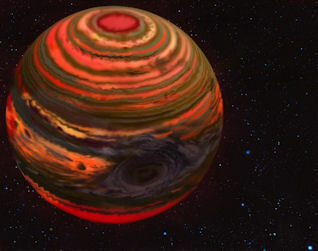 When I use the term 'Dark Star' in my book (1) and internet articles, I'm generally referring to gas giant planets/ultra-cool dwarf stars which are several times more massive than Jupiter, up to perhaps ~13 times as massive (at this point, the gas giant begins to burn deuterium and is reclassified as a brown dwarf). Most examples of these objects (perhaps more than a few million years old) are essentially dark. By contrast, very young examples light up more brightly, because they still retain some heat from their formation. It's a curious quirk of nature that these sub-brown dwarfs are actually smaller in size than Jupiter, despite being heavier. Because these objects are so small, and so dim, they are extraordinarily difficult to observe. 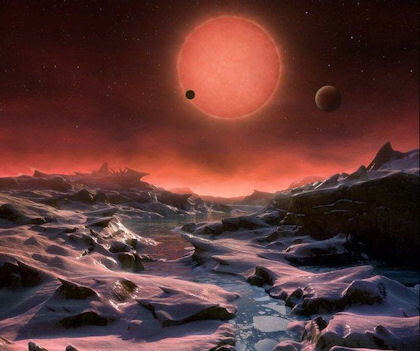 Some have been found, but they are usually either extremely young (and therefore still burning brightly), or are exoplanets discovered orbiting parent stars (and so detectable through gravitational 'wobble' effects, or other means of finding massive exoplanets). 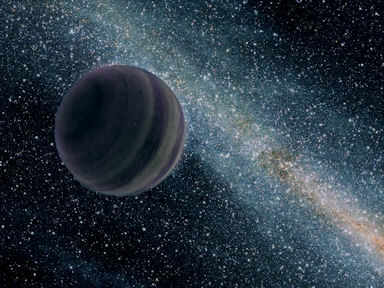 Therefore, if the number of free-floating sub-brown dwarfs (also sometimes known as "planemos") is on the high end of expectation, then it means that there are also likely to be far more of these objects in wide, distant orbits around their parent stars. This, in turn, increases the likelihood of there being a similar Dark Star object (or more) in our own immediate solar neighbourhood. These free-floating sub-stellar Dark Stars are extremely difficult to locate, certainly in visible light. Within our own galactic neighbourhood, astronomers stand a better chances of imaging them using near infra-red sky searches, like WISE and 2MASS, as the sub-brown dwarfs' intrinsic size and density should produce sufficient heat to allow them to stand out from the frigid background of space. Even so, their age (1-10 billion years old) makes then exceedingly faint. It is perhaps no surprise, then, that the trawl across the sky by WISE for these local objects was not particularly successful (5). But these objects need not be distributed randomly through interstellar space. Studies of open clusters and associations of young stars have received much attention in recent years. These clusters may well host the brightest examples of low-mass sub-stellar objects in the solar neighbourhood. The youngest of these associations within 100 parsecs is TW Hya - more usually known as 'TWA'. This star cluster, located about 100 light years away, contains a few dozen 10-million-year-old stars, all moving together through space (6). It is known that many of TWA's low-mass objects are still missing - despite careful study by astronomers for over a decade. They were too faint to have been detectable by ESA's Hipparcos mission, which accurately determined the astrometry of a huge number of stars during the lifetime of its mission. "Two recent discoveries in particular demonstrate the interest of TWA as a laboratory for understanding this isolated planetary-mass population,”said Carnegie's astronomer Jonathan Gagné and co-authors. "2MASS J11193254-1137466 and 2MASS J11472421-2040204 are both candidate members of TWA with spectral types L7 that display signs of youth, and with estimated masses as low as 5-7 Jupiter masses. Their close distances to the Sun place them at the nearer side of the TWA spatial distribution." So, it looks like the number of free-floating Dark Stars may well be more than the number of actual stars in our galaxy after all. This inevitably leads to the following questions: If they are so numerous, and our near-infra red sky surveys have become ever more powerful, then why haven't we been detecting more of them? Is there an intrinsic property of these free-floating interstellar objects which is blinding them to us in infra-red and visible light? These are questions I have attempted to address in a previous paper which considers the potential for such objects to become wrapped in local, dark nebulae (11). The difficulty in detecting them certainly contrasts strongly with the growing numbers of late L-dwarfs (red/brown dwarfs) detected in several moving groups or stellar objects (12). Our own Sun has a shorter lifespan than this. Its main sequence life is expected to last another 5 billion years, by which point it will have burned up all of its hydrogen fuel. Then it will swell into a red giant star, before collapsing down into a white dwarf. For Earth, this post-main sequence (post-MS) phase of the Sun's life will be pretty disastrous. The Sun's expansion to a red giant will swallow the Earth up. However, a less catastrophic outcome might be expected for planets in the outer solar system, beyond, say, Jupiter. In fact, their climates might significantly improve - for a while, at least. The habitable zone of the solar system will expand outwards, along with the expanding star. Saturn's largest moon Titan, for instance, might benefit greatly from a far milder climate - as long as it can hang onto its balmy atmosphere in the red heat of the dying Sun. The expansion of habitable zones, as late main sequence stars become hydrogen-starved, offers the potential for life to make a new start in previously frigid environments. The burning question here is how long these outer planets have to get life going before the red giant then withdraws into its cold white shell. A study published last year by scientists at the Cornell University's Carl Sagan Institute attempted to answer this question (2), choosing to examine yellow dwarf stars whose sizes range from half that of the Sun, to approximately twice its mass. They argue that the larger stars along this sequence could well have larger rocky terrestrial planets in their outer planetary systems than our Sun does (at least, insofar as we know it does!) This is because the density of materials in their initial proto-planetary disks should be that much greater for larger stars (3). Larger Earth-like planets in outer regions mean more potential for stable atmospheric conditions during the post-MS period under consideration. In other words, the growing red giant (which is shedding its mass pretty wildly at this point) would not necessarily blast away an outer planet's atmosphere if that rocky planet had sufficient gravity to hold onto it. And this is where things get interesting. 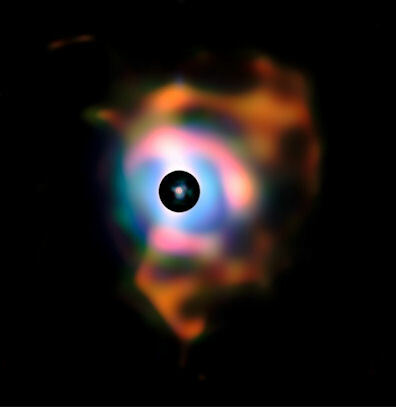 The image opposite, of the red star surrounded by a encircling planetary nebula, is of the red giant V838 Monocerotis, in the constellation Monoceros. This red giant is blowing its outer layers into space without actually turning into a nova (8). 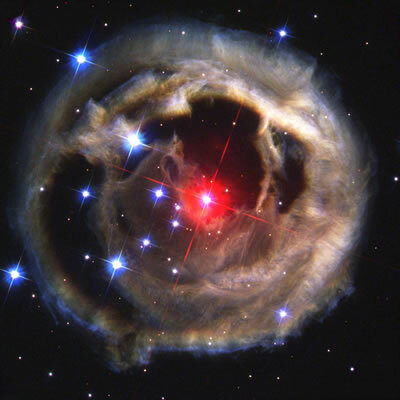 It appears like a red star wrapped up in a dusty nebula. Similar, then, to the imagery I have described for a Dark Star in our own backyard. However, this is on a titanic scale, at the dying end point of a star's life. But it creates an interesting precedent for the kind of structure I've been discussing for a much, much smaller red object, closer to home; itself perhaps wrapped up in a cloud of obscuring dust (9, 10, 11). Let's explore this connection further. Could massive 'clumps' of the red giants' planetary nebulae get interred into interstellar space in great numbers, and after drifting through the darkness of interstellar space, end up getting picked up by the gravitational fields of main sequence stars, like the Sun? I wonder whether the materials driven forth by the red giant could be a source of clumps of dark interstellar material sizeable enough to form massive gaseous planets within them, like Dark Stars and other sub-brown dwarfs. This stunning picture of the planetary nebula in Monoceros relied upon a chance flaring of red giant starlight illuminating the dusty nebula beyond, a phenomenon known as a 'light echo' (8). It may only have been blind luck that this image was even captured. As the red giant dies back, and in the absence of other illuminating sources, this nebula will become progressively darker. Arguably, then, dark nebulae may be emerging from these dying stars regularly, but never witnessed by astronomers. Back in January, I wrote about the 'spaghettification' of stars by black holes, and how this debris field of matter is flung out into the rest of the Milky Way by the supermassive black hole which lies at the galactic centre (12). Clumps of this strewn material, or 'spitballs', are thought to become sizeable free-floating planets (13), including sub-brown dwarfs. Coming back to end-stage red giants, might not these expanding planetary nebulae also provide a non-conventional environment for planetary formation, as matter clumps together in the eddies of this outwardly expanding rush of material? Chips off the old block, one might say. The more we come to appreciate how much material is ejected from young planet-forming star systems, binary star systems (14), star-crushing black holes and red giants, the more we need to accept that interstellar space is far from empty. On the contrary, like a swirling junk yard, it is a vast repository of broken stars, planets and dark nebulae, consisting of material which is either the unfinished detritus of creation, or from repetitive cosmic recycling. This non-uniform stream of material moves around the galaxy, like the stars - but is not sufficiently lit by them to be observable. Mike Brown, one of the two astrophysicists who proposed the existence of Planet Nine in January 2016 (1), is a professor at CalTech, and teaches a variety of courses. One of them, entitled "The Science of the Solar System", is available - for free - online through Coursera (2). The course runs every three months. This month, Dr Brown added a 20 minute video about Planet Nine to the course content (3), which is also available on YouTube (4). A lot of progress has been made about Planet X over the last 12 years or so since the publication of my non-fiction title 'Dark Star'. During that time, I've been keeping my readers updated regularly on press releases about related scientific discoveries, as well as new ideas which might work for the shape and identity of the Planet X body.